Another visit to Stoney Ridge was just as delightful as the past one!! Getting a chance to dive right into another novel by Suzanne Woods Fisher was just what I needed this weekend. A return to a slower pace, familiar faces and great new characters to become acquainted with. The Imposter’s main characters are David Stoltzfus and his daughter Katrina. Honestly though, there were a myriad of characters along with these two, that it is almost unfair to say they were the main characters. There were many characters throughout the story that readers of Ms. Fisher’s past novels will know well from Hank Lapp, to Fern, to Jimmie. The new characters include Katrina’s brother Jesse, exboyfriend John, and newcomer Andy brought their own stories into Stoney Ridge, and there were many new twists and turns as well as romances. So often when reading Amish Fiction we can sense that these characters really are above reproach, but in The Imposter, Ms. Fisher deals head on with issues that all of us are familiar with. I appreciated the honest approach to unmarried pregnancy, gambling and lying. One of my favorite aspects of Stoney Ridge books is the value of family, seeing each of these families deal directly with real issues, and still remain true to each other. Whenever I read books that show how people can have struggles but remain true to themselves and offer forgiveness in the end. All of these topics give me encouragement with my own family life! ind a new love after losing his wife in an accident in the not too distant past. Read this book – you will love meeting all the Amish families in Stoney Ridge. You will enjoy the real-life challenges they all face and be inspired by how they love each other well. 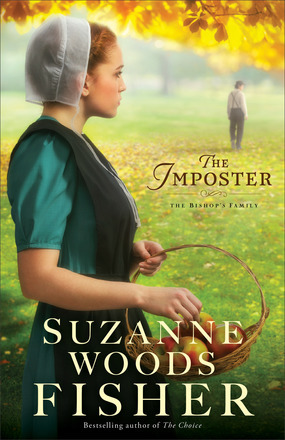 Suzanne Woods Fisher is an author you can trust every time! I love to read her books, and already cannot wait for The Quieting, her next novel in The Bishop’s Family series. NOTE : I was offered a copy of The Imposter in exchange for an honest review.